My last post called “This is Not a Strategy” looked at some mobile learning approaches we have seen companies take that are disguised as strategies but are really not strategic at all. Action does not mean that strategic thinking or direction is taking place. Many companies take on a large initiative with little structured thinking. They dive in and “make stuff.” As you may have read in my last post that is true of strategic thinking and we also see it with companies who do not apply a process. If you have read much of the Float site, we strongly stress the implementation of a process. In fact, we won’t undertake any kind of effort without one. We won’t tell anyone if you don’t have a process but if that is true of your company, read on. It’s important to understand the benefits and advantages of a process because once implemented, your chances for success increase tremendously. I come from a creative background and I must confess that there was a time I would just tolerate the execution of a process on a project. You may have some of your creative people with the same reaction. It probably has to do with the right-side/left-side of the brain modes of thinking. You may have some creative people in your ranks resistant to any methodical forms of thinking. They are more comfortable with freedom of expression and don’t want to be limited by the “rules” of a process. If you can explain the benefits of a process, then perhaps you can get all the members of your team to buy in. Let’s look at some reasons it is important to have a process in the development of your mobile learning application. Once you have a mapped out process, you can reap many benefits. One very important reason to implement a process is that it is repeatable. 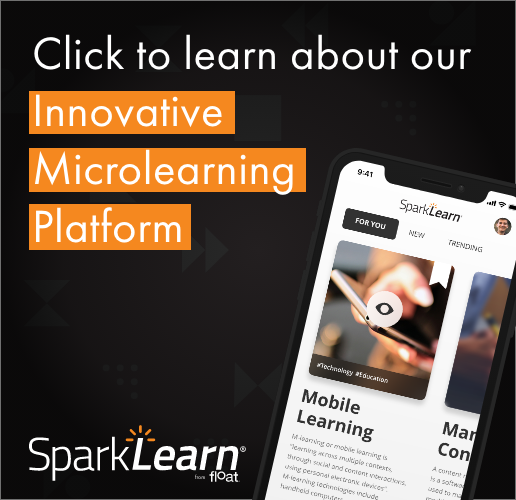 Once you have built a successful mobile learning process, you are most likely going to use it again… and again and again. Just think of what that means. First, the steps in the process become predictable. Everyone involved in the project should have a strong understanding of the progress of the development and what the next step will be. This results in everybody “being on the same page. “And that includes your client! If you can lay out the roadmap of the project development for your client, you can reduce the probability of surprises for everyone involved. When the process is predictable, each person should know his or her role and responsibilities. That reduces the risk of steps or tasks being overlooked or forgotten. How many times have you thought a certain task was being done on a project and then found out that another person thought you completed that task? Implementing a sound process that your employees are familiar with using should cut down and hopefully ease instances like that. A process is also thorough. When you plan all the details ahead of time, you are most likely to cover all the steps you need to take. With a work plan mapped out, you can “check off” the milestones one-by-one as you complete them. This increases your probability of success and reduces your risk. For example, if one of your steps in the process is “Confirm approval from Branding on the graphic design,” you won’t experience the sinking feeling of getting your application stalled just before launch because the Branding department wants to review it. And if that takes weeks, you had to move your launch date. Now, not that having a process means that every step of the way is rigid and inflexible. There is always room for creativity and alternative ideas in a good process. In fact, allow for it and encourage it. But, by having a sound architecture and framework, you will have most, if not all the critical milestones in place that lead up to a successful deployment. Another good reason is that good prospective clients (be they internal, or external) will expect you to have a process. That reason alone should be enough to have one. Do you want to lose potential new business because you don’t have a process? Or if you have one that seems hastily thrown together or incomplete? Many companies (or other departments within your organization) will expect you to have a process and they will even ask you to describe it. That’s because they know using a proven process increases the probability of success in getting the initiative completed. It also tells them they are working with an organization that has expertise and experience in their field. This is a reminder that the people from your company that are customer-facing need to articulate your process. This goes a long way to making a strong positive impression. If you look on the other side of this coin, a sound process is beneficial when you encounter a client who is not accustomed to using one. First, you can educate them on the advantages and even critical necessity of a process and show off your expertise. It is effective when you can show them how a process has been successful on a past project. The other great result of educating them on your process is that you can now lay the groundwork to build a workplan that you are accustomed to using. You will play on your home field. If you are reading this and don’t have a sound process in place, we strongly encourage you to work on one right away. There is really no downside and the advantages are many as you have seen here. Don’t let another project in your company leave the starting line without a clear destination in mind that is defined and determined by a rock solid process.